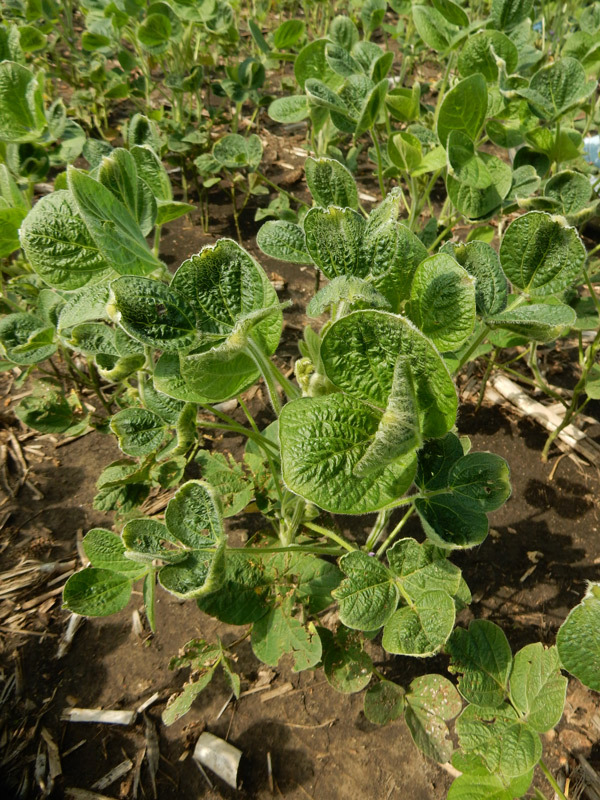 Dicamba injury to non-target soybeans has been widely reported in south central and southwest Minnesota. Symptoms range from cupping and strapping of newly emerged leaves to height reduction and injury to growing points. 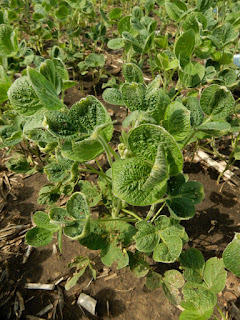 At low dicamba concentrations, symptoms were slow to emerge, showing up 14 to 21 days after exposure. The big unknown, of course, will be impact on soybean yield, which will require negotiations now to determine the most accurate in-field yield comparisons later. Dr. Kevin Bradley, Extension Weed Scientist at the University of Missouri, just published an article that makes it clear that dicamba's wayward ways are not confined just to our state (https://z.umn.edu/2uoz). Historically, dicamba has always been a challenging herbicide to keep in place. Concurrent with the release of Xtend soybean, new formulations and labels were developed to contain dicamba's wayward ways via particle drift, tank contamination and volatilization. Dicamba's high vapor pressure makes it one of our most volatile herbicides. Current technologies have worked to develop new formulations with VaporGrip Technology (Xtendimax and FeXapan) and a new salt formulation (Engenia) designed to reduce volatility. If you think this problem constitutes a problem for U.S. agriculture, let others know how you feel and stop denying the problems and start thinking about what steps need to be taken to prevent this from happening next year. The reasons for off-target movement of dicamba need to be discussed. In order to determine next steps for this technology it is important to have good data regarding the conditions under which the off-target events occurred. This would include suspected particle drift, tank contamination and volatility. Often, out of respect for your neighbor and community relations, one is hesitant to report an off-target incident. However, failure to report also results in a loss of valuable information that could help underscore how this technology will be used in the future. Taking a wait and see approach can result in a loss of valuable information. Herbicide company hotlines are available and many farmers are reporting to their local dealerships, custom applicators, and crop consultants. Information gleaned from these sources will be very helpful moving forward but will be challenging to consolidate. As Dr. Hagar stated in an earlier Crop News, relying on Departments of Agriculture as the sole metric would be to "grossly underestimate the current reality." The Minnesota Department of Agriculture understands this reality and the perception that a call to their agency will automatically result in litigation. A follow-up Crop News will address this issue in more detail, but do note that a call to the MDA complaint line is but a step in a multi-process over which the caller is in control. Contacting the MDA complaint line provides documentation of the issue which will help determine the scope of the problem. It is up to the caller to determine if they want to also pursue a field investigation and litigation/enforcement action. MN Department of Agriculture (MDA) Complaint Line: 651-201-6333 (M-F, 8 am - 4 pm) OR the MN Duty Officer @ 1-800-422-0798 (day or night, 7 days a week). Despite the frustrations expressed to me from various sources, it is interesting to note that a good number still want to keep the technology due to the increasing challenges associated with tall waterhemp and giant and common ragweed biotypes that are resistant to the Group 2, 9 and 14 herbicides. It is critical that we do not get so lost in the details of dicamba's wayward ways that we forget about the broader level of weed management diversification options. Options that currently include (not an inclusive list): Liberty Link technology, preemergence herbicides, earlier applications of postemergence and preemergence mixtures, inter-row cultivation, and herbicide diversification in rotational crops. One final comment, expanding the sale of Xtend soybean as a defensive strategy to prevent dicamba injury is an approach that is not respectful of your neighbor’s freedom to farm as they choose. Consider for example the impact on food-grade beans, organic production and fresh market crops.